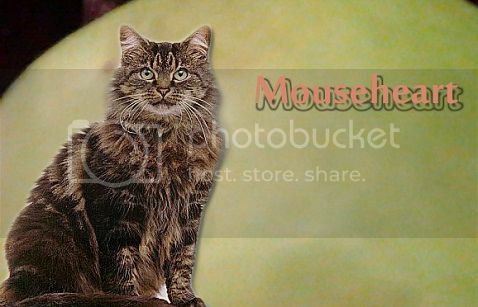 Mousepaw puffed out her chest in pride and padded over to Ebonynose. "Go get to know your new denmate." meowed Ebonynose as she touched noses with Mousepaw. "Tigerpaw, Yellowpaw, Runningpaw, Willowpaw, Mousepaw!" cheered Oatsmudge for the clan's newest apprentices. Berrypaw padded into the FrostClan camp, carrying a mouse in her jaws. She made her way into the medicine den, sitting down to eat her mouse. Violetfrost padded into the FrostClan camp, carrying a mouse in his jaws. He made his way into the elder's den, dropping the mouse at the elder's paws with a dip of his head. Ebonypelt padded into the FrostClan camp, carrying borage in his jaws. He made his way into the den he shared with Berrypaw, placing the borage into the storage. Lilypeak purred and licked at the single tom-kit at her side as he mewled and squealed for milk. 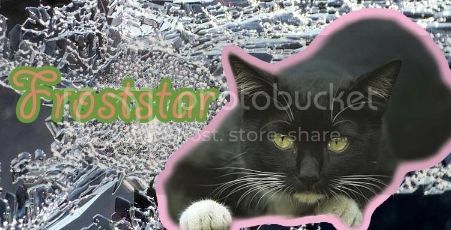 As she touched her nose to the kit, she sent a silent thanks to StarClan for a healthy kit. Ebonypelt padded out of his den, dragging the body of Oceanfur in his jaws. He made his way to the center of the clan camp, arranging the deputy so the clan could grieve. Whitewillow padded over and pressed his nose into Oceanfur's pelt. Froststar touched her nose to Oceanfur's pelt, then tossed her head back in a yowl. "Cats of FrostClan. Listen, And I will appoint the new deputy. I say these words before StarClan so our ancestors may hear my approve and choice...Icefoot will be the deputy of FrostClan!" "Thank you, Froststar." meowed Icefoot with a dip of his head. "Icefoot, Icefoot, Icefoot!" cheered Wolfhollow for the clan's new deputy. Ebonypelt padded out of his den, dragging the body of Froststar in his jaws. He made his way to the center of the clan camp, arranging the leader's body so the clan could grieve. Mouseheart padded over and pressed his nose into Froststar's fur. Icefoot padded over and pressed his nose into Froststar's fur. "It's time." 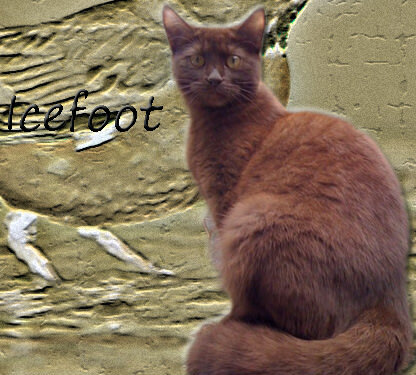 meowed Ebonypelt to Icefoot, turning to lead the deputy out of the clan camp. Icestar raced back into the FrostClan camp, leaping onto the rocks near his den, and let out a yowl as his paws touched the stones. "Cats of FrostClan. Listen, And I will appoint the new deputy. I say these words before StarClan so our ancestors may hear my approve and choice...Mouseheart will be the deputy of FrostClan!" "Thank you, Icestar." meowed Mouseheart with a dip of his head. "Icestar, Mouseheart! Icestar, Mouseheart!" cheered Frostsong for the clan's new leader and deputy. Loudstorm padded past her clanmates, carrying a mouthful of reeds in her jaws, and headed towards the warrior's den. "Let all cats old enough to catch their own prey gather for a clan meeting!" yowled Icestar from the rocks near his den. Wolfhollow pricked up her ears and padded over to hear what Icestar had to say. "I, Icestar, Leader of FrostClan, call upon my warrior ancestors to look down on these apprentices. They have trained hard to understand the ways of your noble code, and I commend them to you as warriors in their turn. Pouncepaw, Tigerpaw, Yellowpaw, do you promise to uphold the warrior code and protect and defend this Clan, even at the cost of your life?"